Primary Camera: 40 MPix Main Camera: 40 MP, f/1.8. Ultra-wide-angle sensor: 20 MP, f/2.2. Telephoto sensor: 8 MP, f/2.4, OIS. Dual-tone LED flash, AI support. 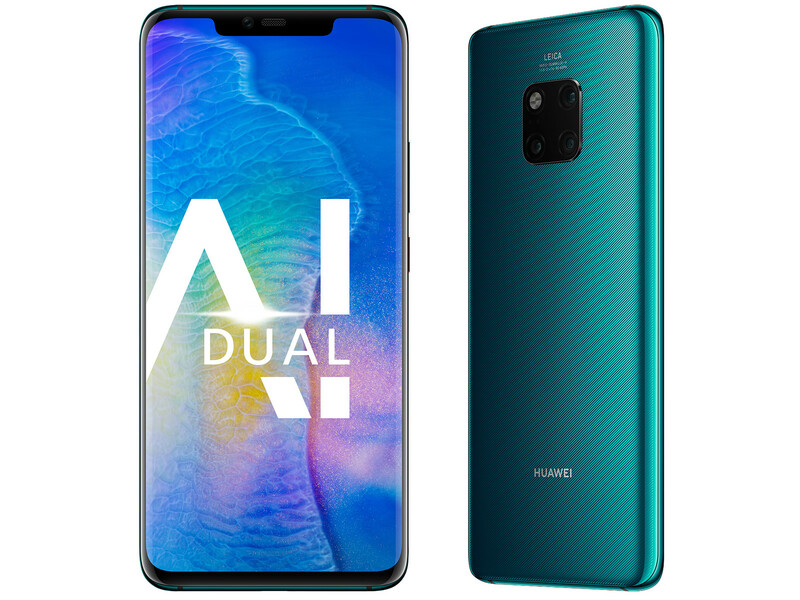 The Huawei Mate 20 Pro’s spec sheet is littered with flagship-level hardware, including the new Kirin 980 SoC, the currently fastest LTE modem in a consumer smartphone, reverse wireless charging and a fingerprint sensor underneath its display. This review will be putting all this new hardware and more through its paces to determine whether the Mate 20 Pro’s technical prowess translates into real-world performance. Update: Wi-Fi tests with final firmware and information about the Huawei wireless charger added. Positive: Beautiful design; long battery life; nice triple cameras. Negative: No headphone jack; high price. Positive: Good hardware; nice design; solid workmanship; impressive cameras; long battery life. Positive: High performance; decent battery life; excellent display; attractive design; impressive cameras. Positive: Nice design; excellent performance; frameless; impressive autonomy; decent cameras; fast fingerprint sensor; quick and wireless charging; face ID; waterproof. Negative: High price; no headphone jack; poor display. Positive: Powerful hardware; high performance; impressive triple cameras; excellent display. Negative: Relatively high price. Positive: Premium design; high performance; excellent cameras; long battery life. Positive: Powerful processor; great display; high autonomy; excellent cameras. Negative: Relatively high price. Positive: Elegant design; excellent cameras. Negative: Inflexible fingerprint sensor. Positive: Big screen; excellent display; decent hardware; nice cameras. Positive: Powerful hardware; premium design; wireless charging; good speakers; impressive cameras. Positive: Nice design; decent cameras; fast charging; powerful processor. Negative: No headphone jack. Positive: Powerful hardware; high performance. Negative: Poor selfie camera. Positive: Powerful hardware; high performance; premium design; impressive cameras. Positive: Impressive triple cameras; decent hardware; nice performance. Positive: Impressive triple cameras; smart AI mode; premium design; solid workmanship. Positive: High autonomy; impressive cameras; fast fingerprint sensor. Positive: Impressive triple cameras; excellent display; premium design; high performance; wireless charging. Negative: Relatively high price. Positive: Beautiful design; nice display; excellent cameras. Positive: Compact size; elegant design; great built quality; powerful hardware; high performance; excellent cameras. Positive: Impressive triple cameras; nice display; great built quality. Positive: Powerful hardware; perfect design; high autonomy; excellent display; impressive cameras. Positive: Nice design; impressive triple cameras; high performance; powerful hardware. Positive: Beautiful design; solid workmanship; impressive cameras. Positive: Powerful hardware; high performance; impressive cameras. Positive: Elegant design; nice display; impressive fingerprint sensor; great cameras; long battery life; quick charging. Negative: No headphone jack. Positive: Beautiful design; solid workmanship; impressive triple cameras. Positive: Nice cameras; great display; fast fingerprint sensor; long battery life; fast charging; powerful processor; good connectivity. Negative: No headphone jack; high price. Positive: Powerful hardware; high performance; excellent display; impressive cameras. Positive: Premium design; excellent triple cameras; long battery life. Negative: Inflexible fingerprint sensor. Positive: Flexible face ID; excellent display; fast charging; nice connectivity; large battery capacity; support waterproof IP68; impressive cameras. Negative: No stylus pen. Positive: High performance; long battery life; excellent display; top cameras. Negative: Relatively high price. Positive: Premium design; powerful hardware; high performance; excellent cameras. Positive: Long battery life; high performance; excellent cameras. Negative: Relatively high price. Positive: Excellent display; beautiful design; impressive cameras; high performance; fast charging; long battery life. Negative: Average speakers; inflexible fingerprint reader. Positive: Excellent display; impressive cameras; waterproof IP68. Negative: No headphone jack. Positive: Premium design; solid workmanship; powerful hardware. Negative: Expensive. Positive: Powerful hardware; high performance; impressive triple cameras. Positive: Large battery capacity; beautiful design; powerful hardware. Positive: Modern design; great cameras; high gaming performance; good hardware; large battery capacity. Positive: Impressive triple cameras; fast fingerprint sensor; powerful hardware. Positive: Powerful hardware; high performance; beautiful design; long battery life; excellent display; impressive cameras. Positive: Very good battery life; fast charging; flexible fingerprint sensor; nice performance; great display; thin frames; waterproof. Negative: Poor cameras. Positive: Impressive cameras; high performance; nice design; powerful hardware. Negative: Poor display; no headphone jack. Positive: Nice cameras; good screen; large battery capacity; fast fingerprint sensor. Negative: No microSD card slot; mediocre speakers; low autonomy; high price. ARM Mali-G76 MP10: Integrated graphics card based on the second generation of the Bifrost architecture. Uses 10 of the 20 possible clusters and according to ARM offers twice the performance per cluster than the old Mali-G72. Non demanding games should be playable with these graphics cards. » Further information can be found in our Comparison of Mobile Graphics Cards and the corresponding Benchmark List. Kirin 980: ARM based octa-core SoC with 2x Cortex-A76 up to 2.6 GHz (performance), 2x A76 with up to 1.92 (balance) and 4x Cortex-A53 with up to 1.8 GHz (power saving). Furthermore, it integrates a fast LTE modem with up to 1.4 GBit/s and is manufactured in 7nm at TSMC.» Further information can be found in our Comparison of Mobile Processsors. 89.78%: There do not exist many models, which are rated better. The most ratings get ratings, which are a bit worse.